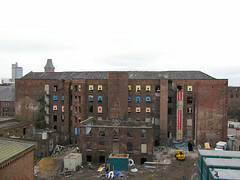 This complex of buildings arranged in a quadrangle was originally built between the years 1798 and 1806 in Ancoats, an historic industrial suburb of Manchester. 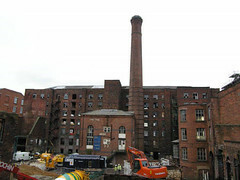 It currently consists of the Old/Decker Mill and the New Mill with their associated Engine Houses and the former administration building on Murray Street. 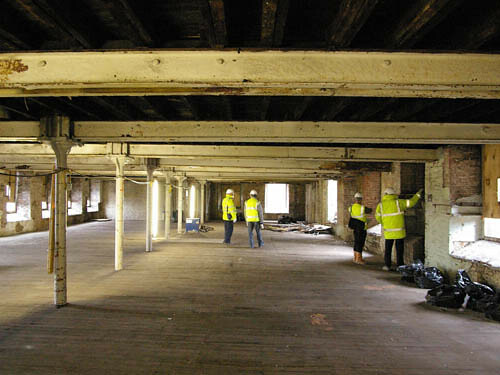 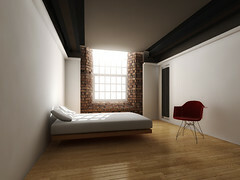 Ancoats Buildings Preservation Trust is the client for the shell-repair and conservation works began on site in September 2004. 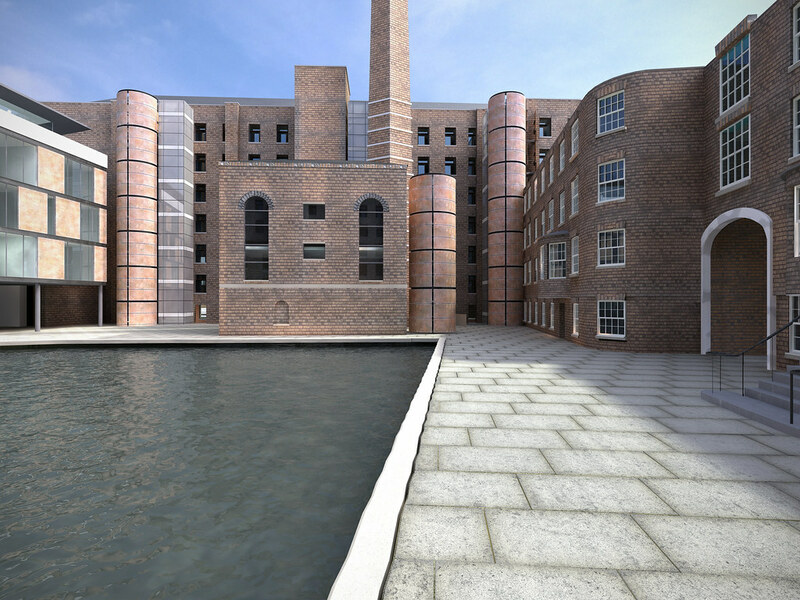 Our client, the Burrell Company/Inpartnership Ltd, has commissioned us to design proposals for the development of these important buildings. 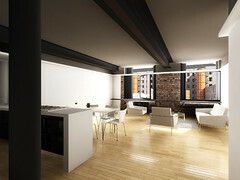 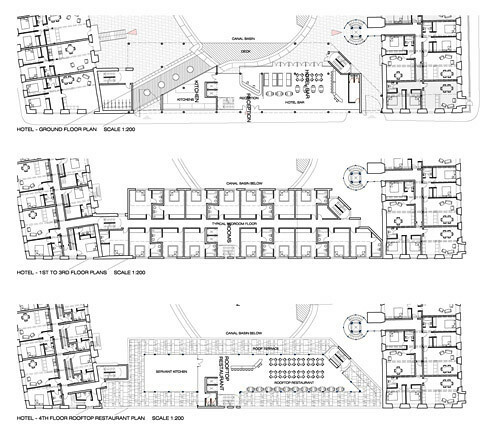 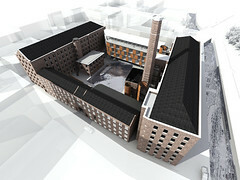 Our scheme, which was identified as the preferred development scheme (won in competition in September 2004) proposes a mixed use for the site consisting 112 apartments and 1700m2 of office space within the mill buildings and engine houses; a Textile Resource Centre/Fashion Centre of Excellence within the Murray Street building; and a 60-bedroom new-build 'boutique' hotel on the currently vacant eastern side of the quad. 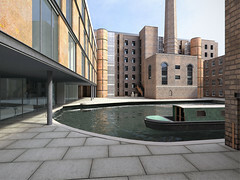 The proposal will also reinstate the canal basin at the centre of the quad. 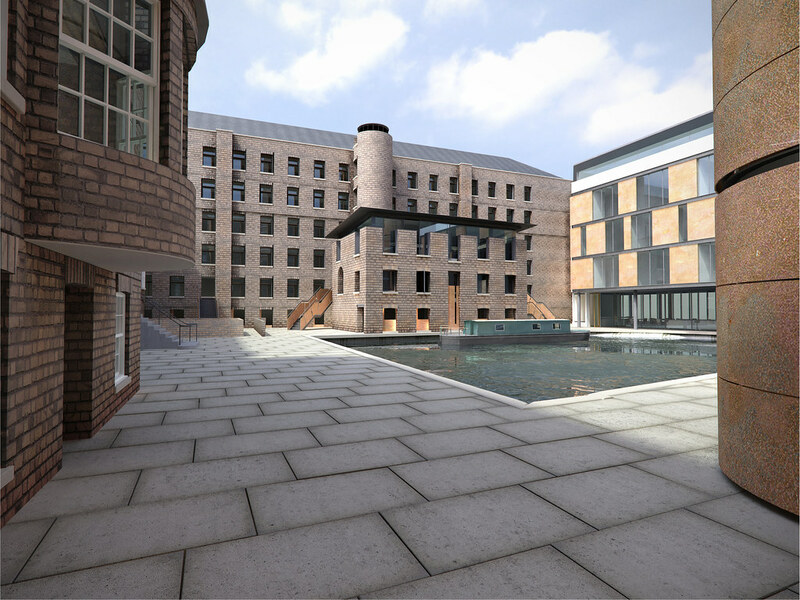 The architectural vision for the re-inhabitation of Murray's Mills is to create an enclosed central space, and to make new architecture which clearly differentiates between the restored historic buildings and new insertions. 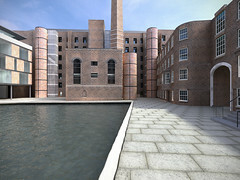 Externally, the new elements consist of corten-steel staircase/lift towers to the Old Mill and the Old Mill Engine House (echoing the form of the existing staircase); new external staircases to the first floor flats in the New Mill; and a glazed lift to one side of the Old Mill's existing brick staircase. 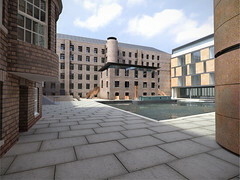 The rebuilding of the top two storeys of the Murray Street building will clearly present the contemporary exterior of the versatile new internal space of the Fashion Centre of Excellence. Each mill has been developed with very differing residential strategies, neither utilizing the usual repetitive internal corridor solution with its inevitable single aspect flats. 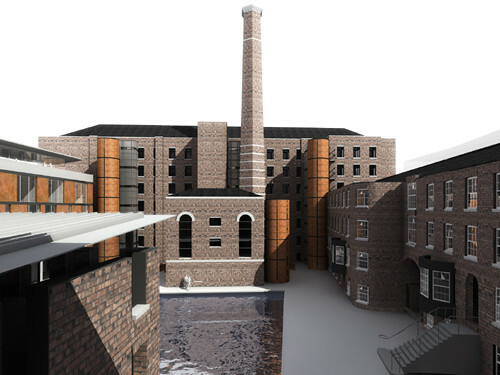 Instead, alternative options were considered to establish through-aspect flats so that the width and structural rhythm of the original warehouse could be appreciated. 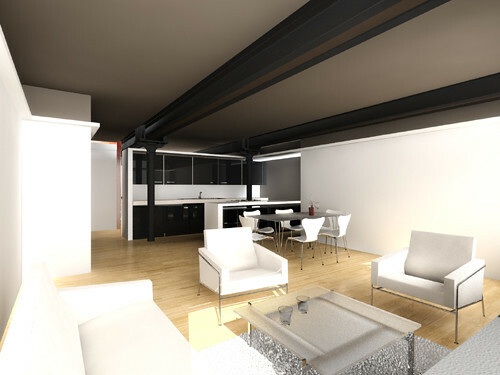 New Mill: Taking our inspiration from the famous Unite d'Habitation in Marseilles by Le Corbusier, the top three floors have been provided with a central corridor down the middle (third) floor, the corridor giving access to a variety of flats on all three levels. 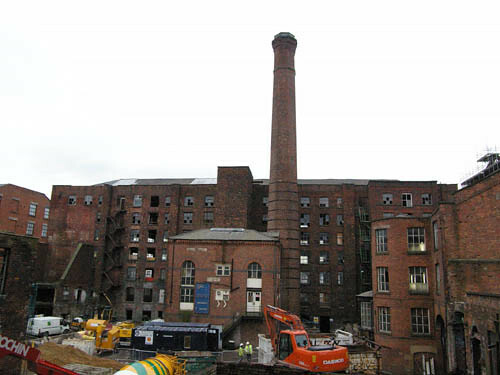 The corridor itself is accessed using the existing Mill staircase and new liftshaft. 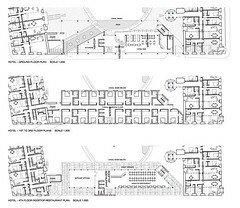 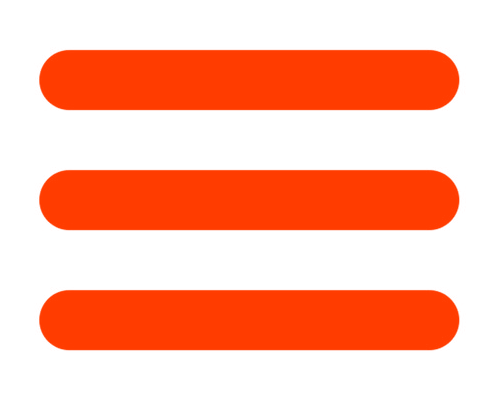 This strategy has the advantage of ensuring the maximum number of possible through-aspect flats and therefore allowing a better reading of the original scale and structural rhythm of the building from within. 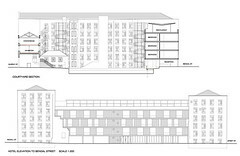 Old Mill: The strategy has been to externalise the circulation using three cores, one being the existing staircase and the other two being new corten-steel staircases and glazed lift towers. 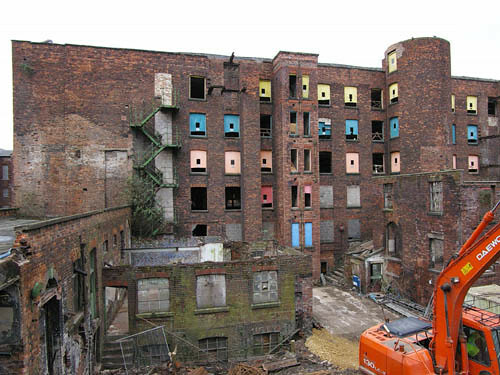 This approach allows us to make the incisions required for apartment access in a forensic manner, i.e. 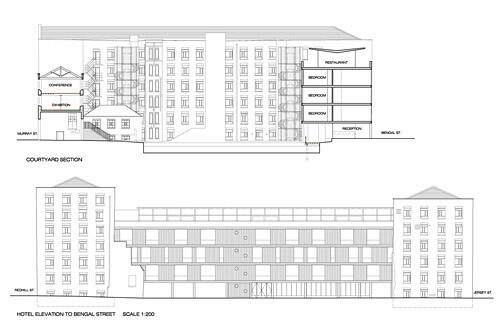 in lieu of new lift and stair cores within the historic structure. 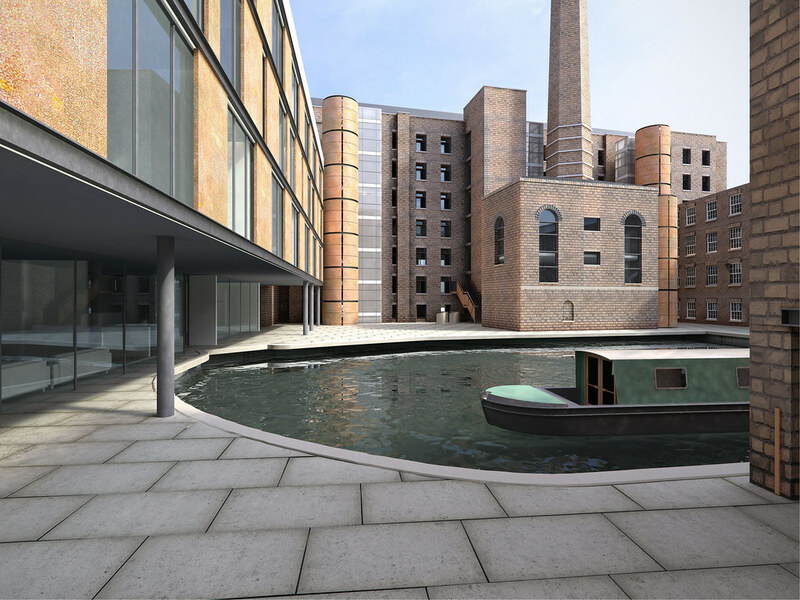 The flats have been planned to provide as many as possible through-aspect and, in a number of cases, through-space layouts which would give views of both the courtyard and the canal from the main living spaces. Planning & Listed Building Consent for the conversion of the two mill buildings and their engine houses was granted in January 2006. 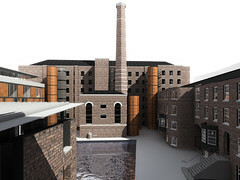 Currently this project is on hold.